Omnifilter Reverse osmosis Filters produce the best tasting water and ice. 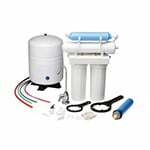 Complete RO filter system kits are available and use standard sized replacement filters. 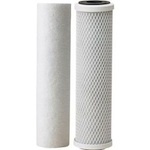 The OmniFilter ROR2000 RO Pre-Filter Cartridges fit the OmniFilter RO2000 Series B Reverse Osmosis System. These cartridges reduce rust, sediment, and the taste and odor of Chlorine, leaving you with water that is as healthy as it is tasty. The OmniFilter OM1 Replacement Reverse Osmosis Membrane is used on Omnifilter models RO2000 and RO2000-TDS. The Omnifilter RO2000 Deluxe 4-Stage RO Undersink Filtration System filters water through four stages to ensure your water is free of the pathogens, dissolved solids and organics, pesticides and VOCs that lurk in your home's tap water.